Written by Nicole Kohler on October 8, 2015 Blog, Holiday ideas. The holidays are often an incredible time for store owners. Sales are up, and with them your profits. Not always the easiest thing to do. Especially when about 15% of shoppers wait until the last two weeks of December to start buying gifts. But all this comes down to finding ways to effectively communicate holiday deadlines in your online store. Whether it’s through a homepage banner, an in-cart notice, or even a dedicated email, you can let your customers know that their time is almost up, and set clear expectations for the arrivals of their purchases on top of that. Read on to learn how to master the art of holiday communication, and — as a bonus — to get first dibs on a spot at our upcoming holiday webinar. If you’re in the United States (or another Western country) it’s easy enough to assume that stores will be shut down — or at least operating slowly — around the end of December. Christmas, New Year’s, and all that. But winter holidays are actually celebrated as early as November and as late as mid-January. Some online shoppers in other countries could be caught off guard if you don’t specifically state when you’ll be closed (or open) to accept orders or ship packages. By making your store’s ordering, shipping, return, and other holiday deadlines visible, you’ll eliminate confusion. You’ll also be proactive, eliminating problems before they happen. It’s easy for shoppers to assume that you’ll be operating on specific dates. But by nipping these assumptions in the bud — and doing so early — you can ensure they place their orders in time for their specific holiday, and that no one is let down. Let’s go over how you can communicate these deadlines properly, starting with the basics: your pre-existing pages. While you’ll probably be taking steps to make holiday deadlines visible on your store, a deadline notice might not provide all the details a shopper needs to make a decision. So it’s a good idea to check on your policies, customer service pages, or any FAQs for accuracy and completeness as early as you can. Shipping times — customers want to know not only in what time period their orders will ship (within 24 hours? 48?) but also when in the day (morning? afternoon?). This information is especially critical during the holidays when last-minute gifts are being ordered. Shipping methods — can you ship overnight or 2-day? If so, which carriers do you support? Some customers can’t receive large packages or might only have P.O. Boxes, so be certain to clarify which methods you offer before they get to checkout. Order deadlines — some stores are able to ship daily, but only if they receive orders by a cutoff time. The same might apply for your holiday deadlines. Make sure these times are marked clearly! Return policies — if an item can be returned, how long does a customer have to ship it back? Are your dates after purchase, or after arrival? Putting these details in place will give potential customers all they need to make a purchase with confidence. This may also cut down on the number of questions you receive during the already busy holiday season. Now that you’ve got the groundwork out of the way, it’s time to focus on ways to communicate deadlines as they approach. One of the easiest ways to get your deadlines noticed is to pair them with the graphics you’re already creating for holiday promotions. For example, if you’re making a banner for your homepage about a holiday sale, it’s simple to add a line of text that says “order by December 17 for guaranteed Christmas delivery” to the graphic. Alternately, if your homepage has multiple spots for graphics or rotating images, you can reserve spots for your deadline images, especially as they draw closer. Keep that information up front and you’ll have fewer confused customers and emails — always good during the busy holiday season. You might even consider creating a dedicated page for order deadlines and shipping times for available methods, and using a special graphic to link to this page. An example of a holiday deadline graphic from Tory Burch. Really want to get the point across? Popups have a bad reputation, but they’re great at motivating your shoppers to take action. Consider trying one to let customers know that order deadlines are approaching… and perhaps offering an incentive to order ASAP. As you come close to major holidays with shipping deadlines, or perhaps times when your store will be closed, you’ll want make absolutely certain your customers see these notices. This calls for a sitewide notice — that is, a small banner or piece of text at the very top of your site that all visitors see immediately. Sitewide notices are usually deployed a week or so before important deadlines, or during sale periods, and utilize bright colors or bold text to ensure that they aren’t missed. Consider deploying a notice of your own about two weeks before any deadlines. Link the notice to any relevant pages where customers can get more information, like shipping policies or a temporary page on your hours of operation. If you’re running WooCommerce, you can enable a sitewide notice by selecting the “Store Notice” box in General Settings and entering the text you’d like to display. Where to enable the Store Notice in WooCommerce. Have something really important to say? Sitewide messaging not enough? You can also communicate deadlines with in-cart notices. Shopping cart messages are usually reserved to upsell customers (“buying this? Why not buy this too?”) or push for more goods (“spend $25 more to get free shipping!”) … but you can use them to communicate about shipping, hours of operation, or even returns, too. Just keep in mind that customers can be easily overwhelmed, so try to limit your in-cart notices to one per session. Pick out the most important message and show it there. 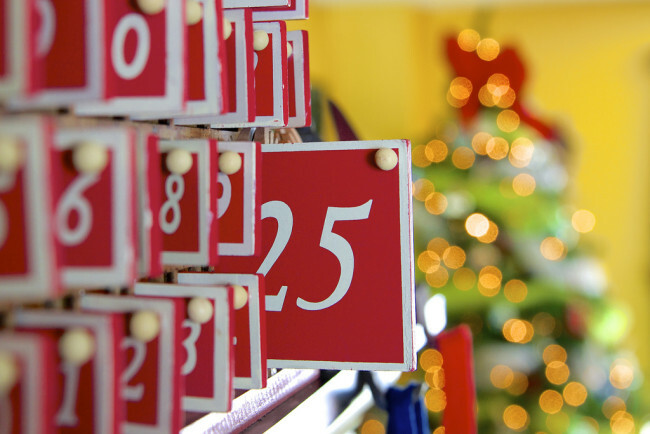 Decide what matters more — upsells or holiday deadlines — and go with that, not both. Again, if you’re using WooCommerce, Cart Notices is the extension to get this done — it allows you to create custom messages that appear based on a shopper’s behavior, and you can customize them any way you wish. Around the holidays, why not change “add $30 more to get free shipping” to “don’t forget: order by December 23 for guaranteed Hanukkah delivery”? An example of a Cart Notice with WooCommerce. Around the holiday season, it’s likely that the frequency of your marketing messages will increase. These external communication methods should also be used to talk about important deadlines. When sending out promotional emails with coupons, shipping offers, or special products, don’t forget to specify how long your customers have to act. Deadlines shouldn’t be written in fine print, but placed right in the graphics or body of the text. And if your emails link to a landing page, the landing page should repeat those details. Along these same lines, if you’re sending out coupons right up until specific holidays, remember to include any shipping deadlines or information on your return policy. Customers might assume they have a few more days to place an order, when in reality your store can’t ship as quickly as they expect. It never hurts to make these details available. As far as social media is concerned, try to craft a simple addition you can tack on to every update, tweet, or pin — like “Remember, order by 12/15 for guaranteed pre-holiday delivery.” You can also use link shorteners to ensure customers who want more details can get them from an external destination, all without affecting your character count. 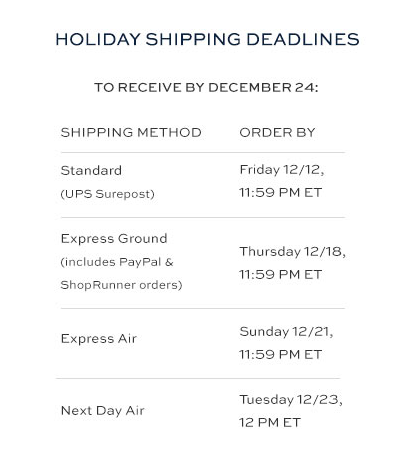 An example tweet containing a holiday deadline — and specifying the type of shipping needed to make it happen. Brilliant! When it comes to communicating holiday deadlines to your customers, you can’t simply say it once. Deadlines must be communicated in multiple spots, with increasing frequency and urgency, for shoppers to get the point — and act on your messages. Hinting at deadlines isn’t effective if you don’t have great groundwork in place, however. The key to effectively communicating — and eliminating as many customer service issues as possible — is thinking ahead. Make sure your policies are clear, your FAQs are accessible, and your team is prepared for any and all questions. Need help preparing for the holidays? We have you covered. On Wednesday, November 4 at 3 PM UTC, WooThemes and ShipStation will team up to bring you a webinar on one of the holiday season’s trickiest topics: handling post-holiday returns. Our webinar has taken place. Missed out on the action? Hop on over here to snag a copy of the slides for free. Have any questions about communicating holiday deadlines to your customers? Or any advice of your own to pass along? You know what to do — the comments await.